Coffee tables are one of the most noticeable sets of furniture, as they are usually placed in the center of the living room. As the principal of D'Apostrophe design puts it, a coffee table is "like the campfire of a room" it is therefore important to choose the best coffee table for your living room. It is around the coffee table you get to place your beverages or drinks as you have conversations or place your beautiful accessories, a flower vessel may be. Wherever your house' focal point is; the fireplace or the view outside, coffee tables add an inviting touch and a warm feeling to your living room. 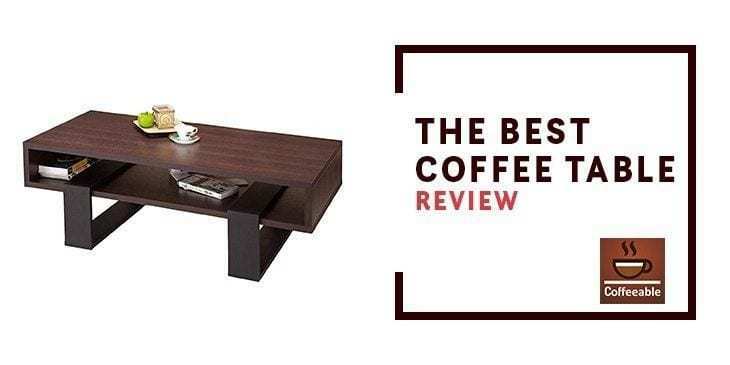 I have reviewed top quality coffee tables that will be a great addition in any living room. Compare the reviews and I know you will get something to suit your needs. 19 x 39 x 17.7"
41.7 x 17.9 x 23.6"
43.1 x 19.4 x 19"
22 x 40 x 18 "
40 x 22.3 x 18"
22 x 44 x 16"
39.3 x 23.6 x 17.7"
31.5 x 31.5 x 16"
41.1 x 19.4 x 19.1"
37 x 21 x 18"
48 x 24 x 18"
28.1 x 42 x 17.9"
20 x 38 x 17"
30 x 30 x 18"
24 x 48 x 19.2"
28 x 50 x 19.5"
31 x 15.3 x 3"
42 x 17.9 x 19.5"
44 x 22 x 16"
47.3 x 23.6 x 17.2"
39.8 x 39.8 x 18"
49.6 x 18 x 17.2"
34 x 48 x 20.2"
DHP Parson modern coffee table well complements apartments or any living room with its classic looks. The table has an incredibly durable finish and wood grain finish making it easy to clean up. DHP Parsons espresso has a hollow core in its making, giving it a lightweight thus it is easy to move the table around the room. The table is very easy to assemble and comes with replacement parts. The table is strong enough so you don't have to be worried about the kids sitting on it or using it as a ladder to reach for something. If you are a looking for a coffee table with a large storage space to put your collection of coffee table books, we recommend the Songmics antique vintage cocktail coffee table. The table has a lower metal grate shelf which provides enough room for keeping not only your books but also your other daily essentials, making your living room look tidy. Songmics antique coffee table has all its 4 feet adjustable hence protects your floor from scratches while adjusting the table's height on an even floor. The table is easy to assemble since it comes with tools for assembling and an instructional manual. Adjustable feet to protect your floor from scratch. Add a sense of style to your living room with the unique Sauder 420011 coffee table. The table's top can be lifted upwards and forward creating a large work surface. You can read a book, surf the web and have a snack all in one table. Sauder coffee table has hidden storage just beneath the top where you can place your remote or magazines; no need to stress out yourself looking for the remote on those dusty corners of the house. There are open shelves to for extra storage and display on the craft-man oak finish Sauder 420011 coffee table. Dorel living faux marble coffee table is a perfect table for those looking for extra organization and hidden storage in the living room. With a storage compartment under the table top for your storage solutions, the table can also be used conveniently for light meals in the comfort of your couch. Apart from the faux marble top, this coffee table has solid wood and veneer giving what Dorel living calls an espresso finish. The top of the table can be lifted upwards and away on hinges, revealing the hidden storage. Glass top coffee tables, never fail in making a small living room less crowded. The sleek see-through design frees up visual space by showing the rest of the room décor. The winsome genoa coffee table has a glass top and a bottom shelf made of solid wood in espresso finish. The bottom shelf is best for displaying accent pieces, a collection of a magazine or even coffee books. This elegant coffee table is also designed with a sturdy wood frame that provides the required stability. You do not expect the table to wobble. One of the outstanding features of the Monarch specialties cocktail table is the metal criss-cross base. With this feature, you can say goodbye to those irritating wobbly tables. You will not have to stress about wedging a piece of paper under the table's leg for steadiness. The monarch specialties cocktail table has a glossy white finishing that makes it blend with your living room's décor or office. The thick rectangular top not only does it provides ample working surface but also adds extra sturdiness and easy to clean. Give your family room an elegant modern look with the monarch specialties scratch resistant cocktail table. Crafted from a blend of metal and glass this eye-catching piece of artwork will create large virtual space with its smooth clear glass-top. Most of the typical glass coffee table does not support a lot of weight, well that is not the case with Suncoo glass coffee table. The glass top is thick enough making it support high weight capacity. Suncoo glass table has a frosted glass bottom which is perfect for storing magazines, remotes and coffee books. The stainless chrome styled steel bars at the bottom, provide extra support giving the table physical strength to support weights and stress. This table model has wide and round table smooth top giving you enough space to place your drink with no tension. The metal x-framed legs are durable and perfectly designed to give a steady posture. thanks to the ash-wood finishing. You will definitely fall in love with the sleek appearance of the black metal frame that are well spaced out to give you ample space to relax your legs. The table is high enough to enable you to reach you for your coffee conveniently from your couch. meaning you can work on your laptop while watching the news or sipping a cup of hot coffee. The finishing on all sides is just out of this world making the table good for a versatile placement. You can easily assemble the Sauder lift top though it will take time be sure to ask for a hand or two. Winsome Nolan coffee table is a traditional rectangular table with a large working surface. The curved legs give it a traditional look and steadiness when in use. The winsome Nolan coffee table has a bottom MDF shelf for storage and display of your valuable accessories and a smooth wooden top. The cappuccino finishing gives a sense of elegance to your living room. The assembling part is the easiest and takes less time since it comes with all the parts and tools needed. The wooden nature gives the table the ability to fit in with your home or office décor. Give your living room an elegant look with the stable winsome Nolan coffee table. The combination of rustic hardwood and industrial steel to make the Emerald Home Chandler table is out of this world. The top is made of thick wood slab highlighting the natural grain. The warm wood tones are inviting and the solid wood shelf is a perfect space for display. The architectural look from the solid steel legs cannot go unnoticed. The steel legs are strongly held together with exposed rivet steel joints, for maximum sturdiness. The legs are further reinforced with crossing brace. The emerald home chandler coffee table is easy to assemble all by yourself without much struggle, all you have to do is read the instructional manual. Designed by the reputable Ashley furniture industries, this rectangular coffee table is a perfect fit for a vintage look for your office or living room. This Ashley furniture signature coffee table is well crafted from veneers, wood and man-made wood giving it a rustic refined look. The bottom shelf comes in a slatted style design best for showcasing your accent pieces and magazines. The wide, smooth rectangular top is large enough to provide ample working surface. The package comes with an instructional manual with step by step guide on how to assemble all the parts. The company itself has gone a step farther and ensured the table is well packaged to protect it from any damages during delivery. The Walter Edison glass coffee table comes with an oval shape and well defined curved legs and a frosted shelving. The chrome-finished steel legs create a stunning piece of artwork as well as make the table strong and sturdy. The glass edges are reduced to slopping edges for safety. Its light weight makes it easy for the table to be moved with a lot of ease. This coffee table is very easy to put together. You will receive a step by step guide instruction on how to assemble it the right way. If you have a small room this just the table for you. A wooden round coffee table with a large working surface made of solid and composite wood with an overall size of 30 inches in width and 30 inches in diameter. The shape of the table and the espresso finish makes it versatile thus the table can blend well in anywhere; the bedroom, living room or at the entry. The slightly flared legs have an x crossed bar giving this elegant coffee table a sturdy posture. The spacing between the legs makes it easy to use the table either when you are sitting or kneeling. The winsome wood toby coffee table comes with all the parts and tools required to assemble. Ashley furniture industries never fail in making chic sets of furniture. They did not disappoint in the making of the Ashley signature contemporary coffee table. This rectangular coffee table gives a rustic look to your living room and includes a metal base with a slatted designed shelf. The legs have casters on them for easy movement around the room. It has an earthy rectangular top measuring 48"w *24" D which provides an ample working surface. The blend of slate and black metal adds a classic feel to your space. With an easy to follow manual, it is guaranteed you will have a hassle-free time when assembling the table parts since all the parts and tools required are available in the package. Do you remember the 80's and early 90's factory carts? Hope you do. Well, the Ashley furniture industries designed a table inspired by the vintage factory carts! This industrial style cocktail table is just irresistible, the mixture the metal base and wooden table top and bottom shelf are a perfect match for any living room. The Ashley furniture signature coffee table has two big casters at its length and two other smaller casters at the width, the coffee table easy to move. With a height of 19.5" and 28" width 50" long this coffee table is just the right size for your large or even small space. You might consider having to place a rug under the table, to protect your floor from being scratched. You can never go wrong with Ashley furniture industries they have made their name as the most trusted source of stylish home décor. Sorbus storage bench chest is a multi-purpose bench; you can use it as a footrest, coffee table, or even as a seat. The bench is finely crafted from faux leather with cushioned padding for a comfortable feeling. The top can be opened to reveal a hidden storage perfect for clearing clutter in a room or office; good for storing toys, blankets, clothes or shoes. Sorbus storage bench comes in a small size which serves as a perfect addition to a small apartment, dorm, walking closet or a playroom. The bench has a lightweight and is quick to assemble since it requires no tool. It can be folded away when not in use to clear more space. Bring organization and tidiness to your space with the Sorbus storage bench chest. Give life to your living room with the Altra furniture Owen coffee table which is able to hold up to 40 pounds in weight and measures 17.8'' in height * 42" long *19.5 "width. The gray hair-pin style metal legs supporting the table make it easy for it to spin at a complete 360 degrees, with their smooth endings. It has a lightweight too. The table top is made of a laminated particleboard and has a brown oak finishing giving a classic industrial look. Altra Owen coffee table is slim enough to fit compact places of a room. The assembling of this table is not as demanding as compared to typical coffee tables. However, the table lacks a storage shelf. The Altra furniture Owen coffee table is a perfect fit for your rustic-themed room. We suggest you use this coffee table for housing remote controls, magazines and other lighter objects. The Monarch Specialties 3286 is a classy table made of a glass base and a chic glossy white table top surface as well as a hollow core. It measures 44*22*16 inches and weighs 39 pounds. The table is richly designed to add a modern polished look to your office or living room. The glass base is well tempered for safety purposes and gives a sturdy posture as well as an extant look. The glossy table top has an ample surface area for working. Due to its small size, it may not be a good idea placing it near a big couch. Assembling the table can be easier with an extra set of hands but even you can do it alone fairly easy. Use coasters as the glossy top easily scratches. iohomes Monroe rectangular coffee table is made of medium fiber board and a laminate walnut table top. This Taiwan made table has interlocking wooden legs that allow a 360 degrees rotation. The bottom shelf area serves as an open display for your valuable accent. The laminate black base finish gives the table an appealing look. We recommend you to use a damp to wipe clean the entire table. The table is easy to assemble especially when done by two people. The laminate base and the walnut top makes the table blend in with your existing home décor. It measures 47" wide by 24" deep by 17" high and weighs 63 pounds. The iohomes company guarantees a hassle-free replacement and parts warranty. The Ashley vintage design coffee table is a rustic round coffee table with well-curved legs. The expansive tabletop provides ample working surface, you can place your drink without worrying about spillage. The table measures 40 inches in width by 40 inches in depth by 18 inches in height. It comes with an easy to follow instructional manual for assembling and all the hardware and tools needed. The table top is made of wood and comes with lower shelf unique weathered veneers. You can trust the Ashley signature vintage casual coffee table to give a tour room rustic theme. The table is well packaged and protected by the company itself to minimize chances of damage on delivering. Are you looking for a coffee table with a modern style? Then you need to consider the Sauder cocktail coffee table. This table comes with a carrara finishing top and measures 49" H by 18" W by 17D. The most outstanding feature of the table is its ever-sheen top coat that makes it resistant to heat, scratches, and stain. The coffee table is made of durable wood so you can be sure of a longer life. It is also finished on all the side making it very easy to place in different areas. An elegant oval coffee table well designed by the Ashley furniture industries and which is a perfect addition to any living room or office. It has a glass top that is well beveled for safety purposes and serpentine designed legs for maximum sturdiness. This Norcastle glass top coffee table is artistically crafted veneers and man-made wood. The oval coffee table measures 48 inches wide by 34 inches deep by 20 inches high. It comes with easy to follow instructions, tools, and hardware for assembling. There are several crucial factors to take into consideration before choosing the right coffee table for your room. The coffee table is made of different materials from glass, metal, wood, and particle boards. Glass coffee tables are the best for small rooms because they make the room look spacious. They also don't take all the attention in the room leaving your guest to concentrate on other pieces of your room. Wooden coffee tables can hold loads of book and other heavier stuff; however, they require attention so as to keep the appealing wood finishing. Different coffee tables come in various shapes from oval, rectangular, square and circular shape. A lot of people prefer the circular shaped coffee table because they are easy to navigate around. They allow everyone to gather around and have a good air circulation. On the other hand, rectangular coffee tables are recommended for larger rooms. They provide spacious working space and are good for gatherings. Square shaped coffee tables are good in creating a central gathering spot in a room with spaced out seats. It is important to consider the amount of money you want to spend on purchasing your desired coffee table. They all come with a different price tag from the ultra-expensive to budget-friendly ones. Just make sure you get a good value for your money and a coffee table that you love. What will be the primary use of your coffee table? Will it be for decorating your living room or for storage purposes, and how much storage do you want. Several coffee tables come with drawers, bottom shelves and even hidden compartments for storage. If you want to go for a decorative table for your office go for one that blends in perfectly with your existing décor. A coffee table's height is the most crucial factor to take into consideration. A perfect coffee table is the one with the right height that you can use conveniently from your couch. Note that a coffee table should not be higher than the seats. Question: Which is the best coffee table? Answer: Well, it depends on the size of your room. If you have a small room we suggest you go for a glass coffee table. It creates a visual free space and most of them are quite small and classic. Question: I find typical particleboard tabletop unpleasant. Which wooden table top you recommend? Question: I need a contemporary coffee table. Which options do I have? Answer: There are quite a number of choices but we recommend you go for a Household ashwood round coffee table. Getting the best coffee table can be a daunting task thus it requires thoughtful consideration. Anyway taking note of the highlighted tips and top recommendations, you will have an easy time selecting the best. A coffee table completes the look of your living room as well as serves as a storage space and room for display, the decision of choosing a suitable coffee table squarely lies on you.